I know I say this every year, but it feels like summer’s flown by in the blink of an eye. Asparagus season feels like it was just yesterday, but here we are, knee deep in peaches and blueberries and corn. Which can only mean one thing…. the onslaught of back to school ads is just around the corner. These muffins are meant to take a bit of the sting out of that realization. 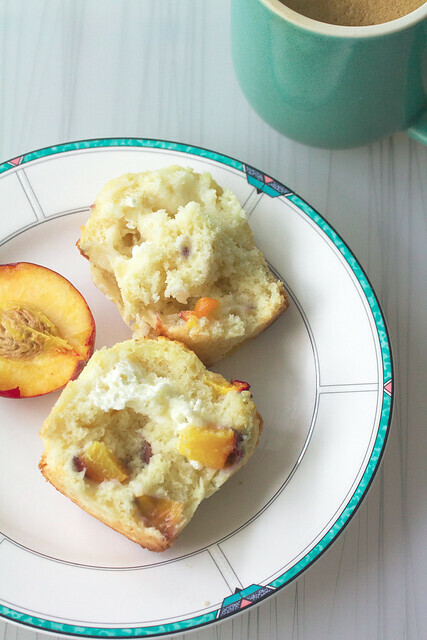 They taste just like summer, with big fat chunks of fresh peach in a sweet buttermilk cake batter, and there’s a lovely little surprise hiding in the middle – a lovely dollop of creamy deliciousness right in the middle. And you’ll never guess what that creamy deliciousness is made of. Believe it or not, it’s Nordica Plain Smooth Cottage Cheese. 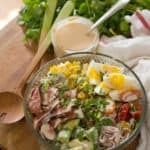 The thing is, this isn’t the old-fashioned kind that your grandmama might have scooped onto a salad. What we’re talking about here is cottage cheese that’s been blended down to a lovely smooth consistency that’s thicker than Greek yogurt, but not quite as thick as ricotta cheese. I enjoy it just spooned into a bowl with some honey and fresh fruit for a light breakfast, but it’s also good for adding a boost of protein to my morning smoothies, or for whisking into my scrambled eggs to make them extra-rich. 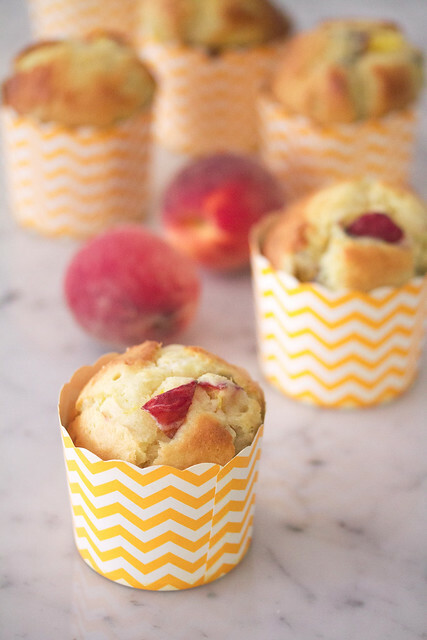 And, in this case, it makes for a delightful little pocket of creamy deliciousness right in the middle of these muffins, because the only thing better than ripe peaches is ripe peaches and cream. 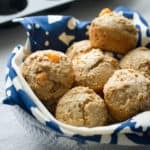 These muffins are perfect for pairing with a big mug of hot coffee for a lazy weekend brunch, or for treating yourself to a little afternoon snack. And, while it pains me to say so, they’re equally perfect for packing up in your lunchbox for work… or school. Preheat the oven to 375F. 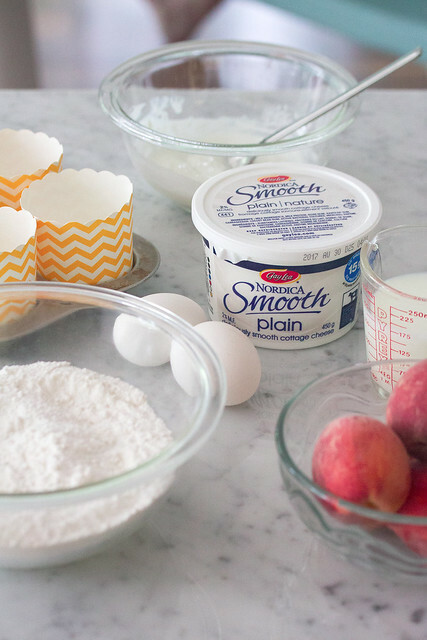 Lightly grease the cups a standard 12-cup muffin pan, or line with paper liners, if you prefer. Spoon muffin batter into the prepared pan, filling each cup about halfway. In a small bowl, whisk together the cottage cheese, yogurt, sugar and vanilla. 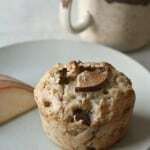 Scrape into a small plastic bag, then snip off a corner and pipe a tablespoon of filling into the centre of each muffin. Gently spoon the remaining muffin batter on top of the filling, covering completely. 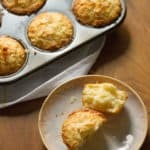 Bake in preheated oven for 17-20 minutes, or until the muffins are golden-brown on top and a toothpick inserted into the centre of a muffin comes out with a moist crumb. Yummy looking! Guess what i need to try this weekend! Love peaches, will have to make these for my coworkers. Thanks for hosting this cool giveaway! Love farm-fresh peaches every year! Looking forward to trying this one. Also, hadn’t considered using cottage cheese as a protein boost in my smoothies—thank you for the great tip! Ok, first of all, I’ve had Peaches by the Presidents of the USA in my head all week, so there must be something going around. All these yummy seasonal peaches… can’t help it. Second, this is a very cool recipe. The bit of cottage cheese was surprising, but then I was kind of nodding along. Makes sense. It’s a more versatile ingredient than a lot of people realize. I don’t bake with peaches often enough (too tempted to just eat them all I suppose), but I love the flavours and I really do love the sound of this. Now then, if the weather would just cool down for one afternoon maybe I’d be tempted to turn on the oven…. Yes!! This is exactly what I need right now. I literally threw out all of the stale cereal in my house yesterday (I’ve been off cereal for a few months now), and I’ve got a ton of fresh peaches that I bought and made plans for. I can’t wait to make these!! 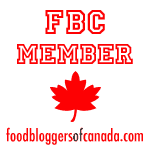 Peaches, peaches, peaches – I use them up and then more re-appear in my kitchen. 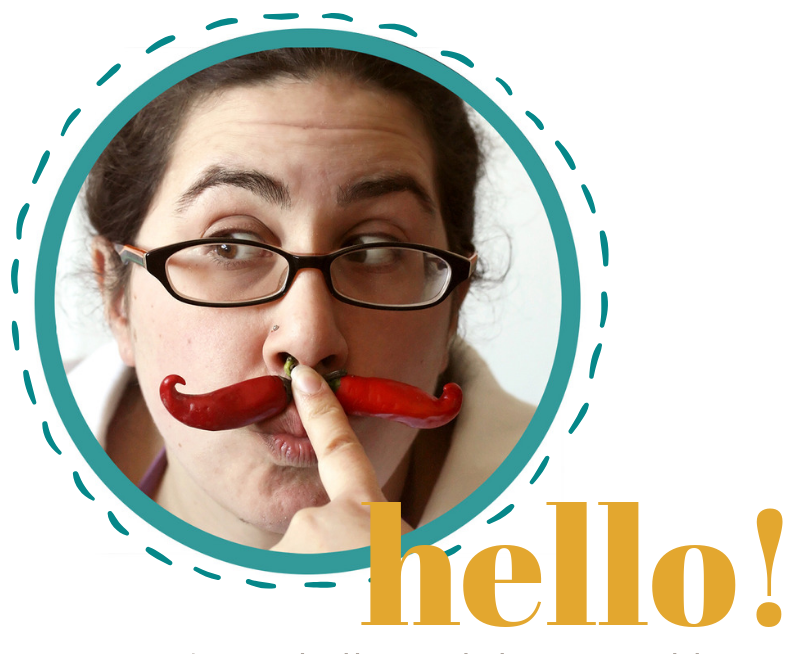 No complaints except that I am using up all my fav recipes, leaving me hunting for something new – and up pops yours! Will hunt for that cottage cheese and give this a try! 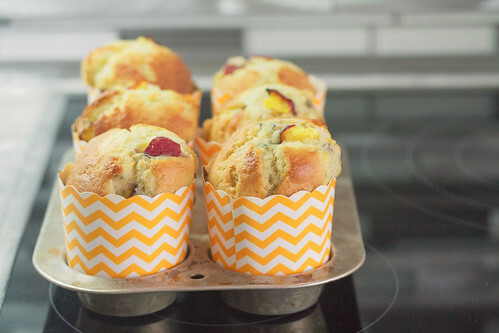 These muffins look fantastic (love the cracked tops! You can tell it’s gonna be good before you even take a bite), and though I love all the peaches and the corn, I’m crying a little that we are already there in the growing season…. 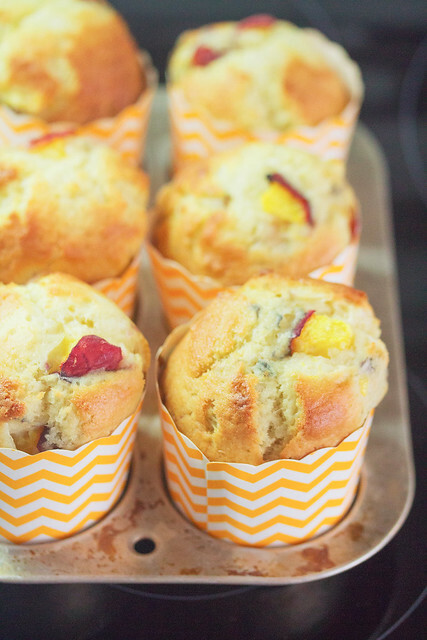 I just love muffins, and if they’re that good and that pretty, even more! What a great use the cottage cheese in the middle! I am sure it tastes fantastic in combination with the juicy sweet peaches. Thanks for the opportunity to enter the contest!